New version available via app update which fixes various issues. Check the in-app changelog for more info. Download and update from the re-distributable pack below. New version available via app update with a few bug fixes. Primarily Vanilla save parsing is now fixed again. I forgot to mention that since the last update, you can now decrypt save files using the application so there is no need to decrypt the file on your PSP before editing it. 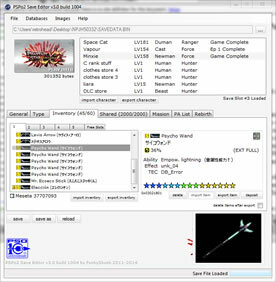 You must have SED.exe installed (the application will ask you if you want to install it when you open it) and the correct save data key in the "data/keys/" folder named GAMEID.bin (e.g. NPJH50332.bin). 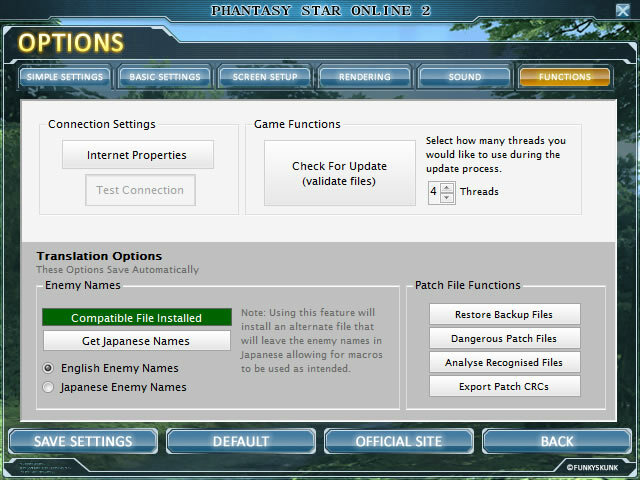 The save data key is the same for ALL versions of Phantasy Star Portable 2, so if you have one you can just copy it for all the game ID's. 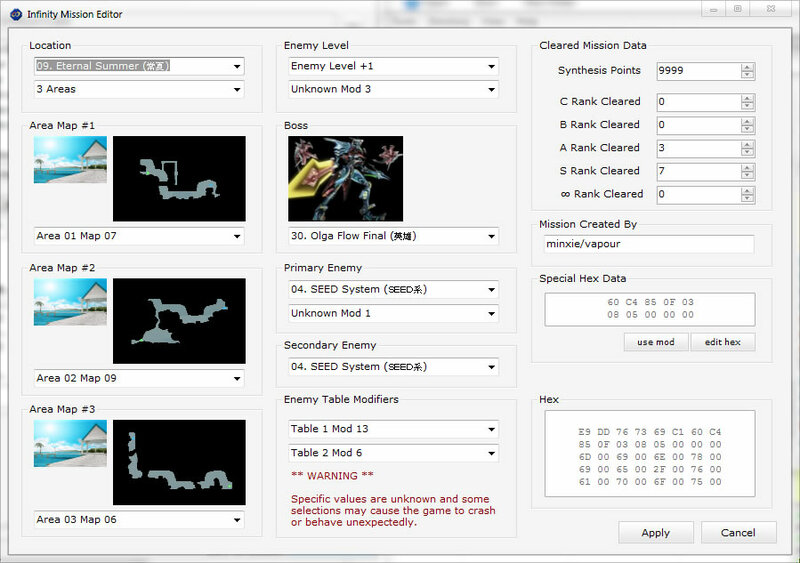 I'm really happy with the Infinity Mission editor which was also added in the previous update but would like to understand some of the options a bit more. If you can help, contact me on twitter @TheRetrohead. As the servers for the game are now offline, I am now releasing the editor only as it is easier to update rather than restricting things to the viewer only. You have been warned so you only have yourself to argue with. I am officially discontinuing my Phantasy Star Online 2: Translation Launcher. There are much better alternatives available now so there is no need for me to keep updating mine. It was fun while it lasted but was really too much work for me to keep updating. 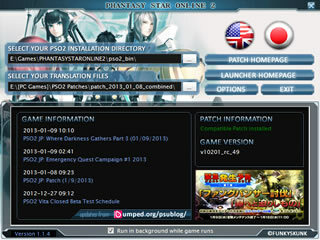 A launcher for use with PSO2 that replaces the official launcher. It will backup all patchable menu files when you launch the game then restore them once the game exits. 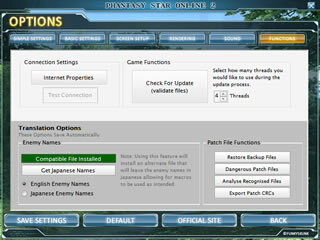 It can also install translated story files, update your PSO2 installation, edit options and give you a server status update. Added: Option to ignore story patch update warnings in Tool Box >> Story Patch (off by default). Fixed: Restore story backup files button is now always enabled even if there are 0 files shown in the backup directory. Fixed: Backup now shows "Unknown Backup Files" as default. Fixed: The launcher now checks SEGA's patches_old directory during update checks, dangerous patch analysis and story backup restoration. Fixed: If restoring the story backup files fails, the installer now knows it's gone. Fixed: Cancel button was showing still after updates on validation processes.